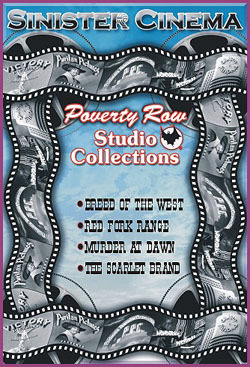 Forgotten Horrors > DVD > Westerns > Poverty Row Collections > Poverty Row Collections-New! BREED OF THE WEST (1930) Wally Wales, Virginia Browne Faire, Buzz Barton, Robert Walker, Lafe McKee. Wally plays a ranch hand who falls in the love with the boss’ daughter. His rival for her affections is the ranch foreman. Things get sticky when the foreman tries to rob the boss. RED FORK RANGE (1931) Wally Wales, Ruth Mix, Al Ferguson, Cliff Lyons, Bud Osborne. Here’s one that isn’t around too much, a real obscure early ‘30s cheapie. Wally owns a stage line that is vying for a big government contract. A stage race between Wally and his competitor will determine who gets the contract. His opponent has no intention of making an honest race of it. MURDER AT DAWN (1932) Jack Mulhall, Josephine Dunn, Mischa Auer. Mulhall and Dunn are engaged. They head for the mysterious mountain hideaway of Dunn’s father--an eccentric professor--to obtain consent for their marriage. The professor has been working on a death ray that uses power from sunlight. Lots of murders and mysterious goings-on ensue, complete with trap doors, faces at windows, falling bodies, and other weird events. Death ray special effects by Ken Strickfadden. THE SCARLET BRAND (1932) Bob Custer, Betty Mack, Robert Walker. A wandering cowpoke is tricked by rustlers into appearing to work for them. He’s then cornered by angry ranchers and branded! After that, he sets out to prove his innocence and track down the rustlers responsible.